Sukhothai-Style Noodles: When you say "Thai Noodles" to a Westerner, they probably think of Pad Thai. Pad Thai is not a particular favorite of the Thais ­ there are so many other delicious kinds of noodles to choose from. 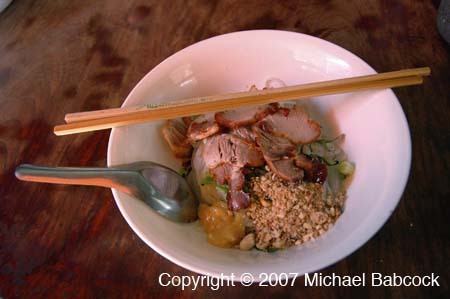 Such as these "Suhkothai Style Noodles" – hot, sweet and multi-layered (mix before eating). Kasma teaches this dish in Series Set F (class 4) – one of the few places in the United States where you can sample this treat. You might also enjoy seeing Kasma's Thailand Trips Food Sampling photographs.